If you have seen a dog that you would like to adopt from us, the first step is to complete and return the Pre-Adoption form. By completing this form, it gives us the information we need to ensure your dog will be a great match and saves time during the adoption process by having all the information we need close at hand. Once we have received your pre-adoption form, we will contact you for an informal chat and to discuss the dogs which may be suitable. If there is a dog that meets your requirements, a £50 non-refundable reservation fee will be required to reserve your dog until the adoption process is complete. This reservation fee will be deducted from the final adoption fee. Should you change your mind during the adoption process, the reservation fee will not be refunded. Following receipt of your reservation fee, we will then arrange for one of our volunteers to visit you to undertake a home check. Following the home check, if everything is satisfactory, we will discuss available transport options and dates with you to bring your dog to the UK. If your home check is not successful, we will return your reservation fee. The adoption fee is £150 to £300 less the deposit. Depending on which transport company is used, the fee for transporting your dog is between £140 – £200. The transport arrangements will be discussed with you fully prior to booking any transport arrangements. The balance of the adoption fee plus the travel costs will be due for payment one week before your dog is due to travel. What your adoption fee covers: all our dogs will be spayed/castrated (unless they are puppies). They will be microchipped, fully vaccinated and have received worming and flea treatment. All dogs will travel with an up to date pet passport. Please note,we are not able to transport our dogs until the adoption and transport fees are paid. We endeavour to match the right dog to you and your circumstances and we only re-home dogs that we believe to be in good health with good and even temperaments however, we cannot accept responsibility for any problems and/or costs resulting from illness/injury that may occur or develop subsequent to adoption. We welcome any questions during the settling in period and are happy to provide advice if needed to make the first few weeks as easy as possible. Any dog re-homed by us must be returned to us directly should the adoptee not be able to keep the dog for any reason. Any donation or transport fees already paid will not be refunded. Those friendly eyes. And don’t even get me started on that wagging tail. How many of us have fallen for a shelter dog? Adopting from a shelter is a great way to tackle dog overpopulation, offer a caring home to a pup who really needs one, and add a lovable new member to your family. There are some things you can do to make the transition as smooth as possible for the both of you. 1. Choose the right dog for your family. Don’t always go for the first dog you feel drawn to. Research breeds to see which ones level of care is right for your family. You should also visit the dog to find out how they get along with other pets and/or children. 2. Have everything you need before you get home to avoid unnecessary trips. Make sure you have a harness or collar, leash, food and water dishes, a bed, and a kennel (crate training is a great way to keep your pet safe and secure). 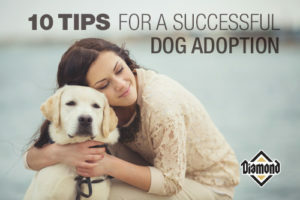 This can allow you to focus on your dog post-adoption. 3. Put an exercise plan into place immediately. Dog owners often surrender their pets because they cannot give them adequate exercise, which may lead to behavior problems. Have a realistic exercise plan in place that gets your pup plenty of physical and mental stimulation. You may need to factor a dog walker into your pet care costs. 4. Transition your pup’s food slowly. Digestive issues can make a time of change even more difficult on your dog. Find out what food the shelter fed your dog. Start by mixing a little bit of your dog’s new food, like Diamond Naturals Adult Dog Lamb Meal & Rice Formula into the shelter’s food. Over the period of about a week, slowly increase the amount of new food you add to your dog’s mix, while decreasing the amount of the current food. By the end of the seven-day transition period, your dog should be comfortable with their new food. 5. Give your dog a safe space. Usually a kennel, sometimes a dog bed or a room, all dogs need a place where they know they can get some time alone. This space should always be treated with positivity. If they are punished in their safe space, well, it doesn’t seem like such a great place to relax anymore, does it? Creating this haven gives your dog a place to alleviate their anxiety, or at the very least, a simple place to call their own. 6. Speaking of space: Give your dog enough room to adjust. Cuddling, petting and walking are great. But there may be times that your dog just wants to be alone. Letting the dog come to you in the first couple of weeks will build trust, even though it may seem counterintuitive. 7. Get into training ASAP. Training can make even the most rambunctious dog into a great family dog. Check out nearby training courses and choose one that fits your style and needs. 8. Only discipline during the bad act. Dogs don’t have memories, and they can’t put two and two together. If you come home and find your dog has had an accident in the house, bringing them to the accident and yelling is just confusing and scary. You must catch them while they are actually peeing. When this happens, a short “No” will stop it. Bring them outside to continue. When they pee in the correct place, praise them. 9. Avoid overwhelming your dog with new places and new people. You may want to show off your dog after you bring them home. However, for your pet’s comfort, minimize their exposure to new people and places until they are well adjusted to you and your family. Decide on boundaries and enforce them right away. If your dog can’t go on the couch or sleep in your bed, don’t let them get away with it just because they are new to the house. With these tips, you can make your new dog’s adjustment easy and you’ll feel like you just might be a dog whisperer after all.